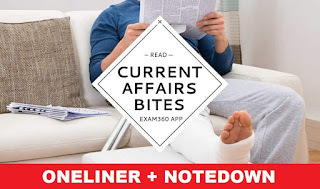 In the Current Affairs & GK Update of 6 August 2018 we cover all important National,International,Financial,Sports news, nominations, agreements which are relevant for upcoming SBI PO,SBI Clerk,SSC,IBPS RRB exams.We at Achieversrule regularly provide One Liner Current Affairs and GK Updates to keep our candidates prepared for Current Affairs section of Banking,Insurance exams and current affairs exam. Union Defence Minister Nirmala Sitharaman calls on the start ups to come up with potential solutions for technological needs of defence establishments while launching the Defence India Startup Challenge in Bengaluru. Union defence minister also launched SPARK (support for prototype and research Kickstart) in defence, framework for IDEX partners, and promotion of start ups under Make II procedure. The iconic Mughalsarai Railway Junction in Uttar Pradesh has been renamed as Deen Dayal Upadhyaya Junction Railway station; BJP National President Amit Shah inaugurated the renamed station. Government has approved 122 new research projects of 112 crore rupees under its Impacting Research Innovation and Technology ‘IMPRINT-2’ scheme. The initiative aims to advance research in energy, security, and healthcare domains in the high education institutions. With the elevation of Madras High Court Chief Justice Indira Banerjee as a Supreme Court judge, it will be for the first time that the apex court will have three sitting woman judges, creating a new record of sorts in the Indian judicial history. Banerjee will join Justices R Bhanumathi and Indu Malhotra. The U.K. government on Sunday announced new plans to change the law for organ and tissue donation to address the urgent need for organs within Indian-origin communities in the country.The announcement comes as a recent report called on the National Health Service (NHS). Zimbabwe President Emmerson Mnangagwa, a former ally of Robert Mugabe, narrowly won the country’s first post Mugabe election. Singapore Prime Minister Lee Hsien Loong kicked off the 51st ASEAN Foreign Ministers meeting in Singapore . Ajay Data, Founder and CEO of Data XGen Plus, has become the first Indian to be appointed a member of the Country Code Names Supporting Organisation (ccNSO).The ccNSO of the Internet Corporation for Assigned Names and Numbers (ICANN) is a policy-development body for global issues regarding country code top-level domains (ccTLD) within the ICANN structure. PHD Chamber of Commerce and Industry (PHDCCI) and Confederation of Nepalese Industries (CNI) has signed a memorandum of understanding (MoU) to establish India-Nepal Centre. India's golfer Gaganjeet Bhullar on Sunday won his maiden European title as he held out a record-breaking charge from Australian Anthony Quale to win the Fiji International. PV Sindhu wins silver, loses 19-21, 10-21 to Carolina Marin at World Championship final 2018. Union defence minister: Nirmala Sitharaman. Union Railway Minister : Piyush Goyal. Minister of state for railways:Manoj Sinha. Kitty van male is the top scorer of recently concluded Women's Hockey World Cup 2018. Capital city of Suva- Fiji. Current president of Nepal: Bidhya Devi Bhandara. Current prime Minister of Nepal: Khadga Prasad Oli. Full form of ASEAN: Associations of South Asian nations.